For those who will be buying a new truck this summer, they might want to take a look at the all-new 2014 GMC Sierra full size pickup. General Motors has developed a new 4.3-liter V6 powerplant that will pump out more torque than any other standard V6 in its class. And torque is what truck buyers want if they will use their new pickup for any kind of work or towing. Why would truck buyers be interested in torque over horsepower? Torque is that wonderful force that performance enthusiasts can’t get enough of, and generates neck-snapping off-the-line acceleration and also provides pulling power performance. The new 2014 GMC 4.3-liter V-6 EcoTec3 will produce 285 horsepower, but will come with the most torque of any standard V6 in the segment: 305 lb ft (413Nm). That’s a huge bump in torque from the previous model’s 260 lb ft. The previous generation V6 engine had the worst performance of any full-size pickup. All new 2014 Sierras equipped with the new EcoTec3 V-6 will have trailering ratings up to 7,200 pounds (3,266 kg) for a regular cab, short bed, and four-wheel-drive model which is 500 pounds more than the Ford F-150 3.7-liter V6 and 700 pounds more than a Dodge Ram 1500 3.6-liter V6. Sierra’s standard V-6 will come mated with an efficient six-speed automatic transmission. GMC has not released EPA fuel-economy estimates but will be released closer to launch. How did GMC do it? Sierra’s new V-6 features three state-of-the-art technologies that will finally make the new powerplant competitive. It features new direct injection technology, active fuel management (cylinder deactivation) and continuously variable valve timing. These are not new technologies that are unique to GMC, but the large automaker has finally updated their V6 to be in line with the rest of the manufacturers. GM says they perfected the new V6 through 6 million hours of computational analysis by engineers studying the combustion process, and 10 million CPU hours were spent refining and making the most of the Sierra’s EcoTec3 engines. Can the 2014 GMC compete with the F-150? It looks like the standard V6 engine in the all-new 2014 GMC Sierra offers the most torque of any standard V-6 in the class. For now, V6 buyers have a good option with the most pulling power over the Ford F-150 and Ram V6 models. Will it be enough to enable GMC to compete? With Ford’s EcoBoost engines leading the field, it’s just a matter of time before we see Ford and Chrysler come out with their own high-torque V6’s. 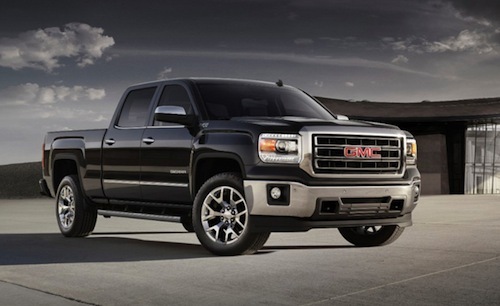 At least for 2014, GMC may have the edge. 2014 GMC Sierra models with the 4.3L EcoTec3 V-6 go on sale this summer with a suggested starting price of $25,085, that includes destination. Watch the 2014 GMC Sierra Launch video.